More than 500 people in Cumbria spent the night with relatives and friends or in emergency shelters after floods swept across the county. Cockermouth and Keswick were worst affected, but communities across Cumbria felt the impact of the deluge. More rain is forecast later, but the Environment Agency said the floods should continue to recede. 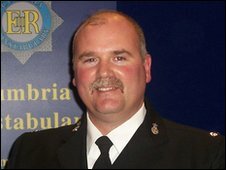 Tributes have been posted on a police Facebook page to Pc Bill Barker, who was swept to his death in Workington. The Environment Agency said it hoped Saturday afternoon's rain would pass quickly. A spokesman said: "Whilst it might make life a bit unpleasant, I don't think it will add to the flooding problems. "We are looking forward to being able to perhaps begin to get people back to look at their houses as the clean-up operation begins and the flood levels, I hope, will begin to recede." Cumbria police said emergency services and local authorities had been planning operations for the rest of the weekend. Checks would be made on the safety of bridges and on flooded properties to see whether any more people needed assistance. About 1,100 properties have been inundated. 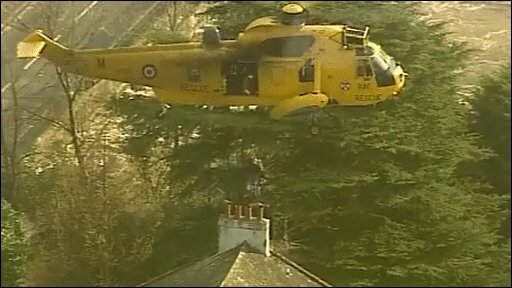 The RAF, RNLI, mountain rescue teams and emergency services, helped move about 300 people from Cockermouth where parts of the town were more than 2.5m (8ft 2in) under water. Cockermouth School and the Sheep and Wool Centre in the town were accommodating about 75 people. More than 50 people rescued in Keswick have been taken to the town's convention centre, Skiddaw Hotel and St Joseph's school. Police have warned people to stay away from bridges, after water pressure also destroyed the Southwaite footbridge in Cockermouth and the nearby Lorton Bridge. Residents, especially children, are being urged to stay out of the floodwater, which contains sewage. The prime minster is among those who have paid tribute to Pc Barker, who fell into the River Derwent when Workington's A597 bridge collapsed. The father-of-four had been an officer with the force for 25 years and would have celebrated his 45th birthday on Saturday. 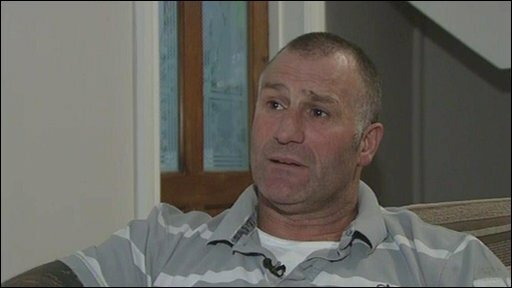 Gordon Brown said: "Pc Bill Barker died trying to save the lives of others. "He was a very heroic, very brave man who will be sorely missed by everybody who was close to him. "I think we owe him a tremendous debt of gratitude for the service he has shown." Many people have signed up to a tribute page on Cumbria Police's Facebook site, pledging their support to the officers and staff risking their lives to help those affected by the floods. The Queen has praised emergency workers who are still providing support for residents in flooded areas. She said: "My thoughts and prayers are with all those who have been affected and whose homes and livelihoods have been damaged." 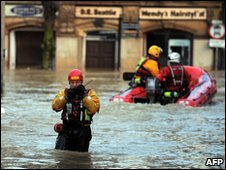 Towns and villages in the south of Cumbria, including Ulverston and Kendal, also experienced flooding.